Is it a habit yet? How you are doing with the Fit Moms for Life foam roller. Do you find yourself using it much or are you finding excuses as to why you don’t need it? If you are struggling to use it consistently, here are a couple of tips that have helped me become a more consistent foam roller. #1 Keep the foam roller in an area of your house or office that you walk by frequently. Seeing it will keep it near the top of your mind. #2 Roll out one side of your body and then walk around, jump around, and feel how much better that side feels than the side you haven’t rolled out yet. #3 Start small. Start with 30 seconds of calf rolling on each side. You will feel better and this will give you more motivation to continue rolling more muscles. Have you begun to see some really great results from the foam roller? If so it would mean a lot to me if you paid it forward and shared your experience on Amazon. I really want the Fit Moms for Life premium foam roller to be a tool that relieves millions of men and women’s muscle and joint pain, and allows them to move more freely. Since the launch of our foam roller there have been many people sharing their results over on Amazon. Here are just a few…. I recently received a free sample of the Fit Moms for Life Foam Roller to give my honest feedback. I was anxious to try it right away and immediately noticed the difference from an ordinary smooth foam roller. The honey comb design on the roller really made a difference in working the muscles nicely, giving a loose and relaxing feeling without the pain you can get with some of the similar equipment. The grooves dig in the muscle giving you a nice deep tissue massage. As a dancer, I have used a lot of foam rollers. The cheap, solid foam rollers that are commonly available are just too soft, squishy and have a short lifespan. They don’t really get deep enough like you get from a real massage. The harder PVC pipe type rollers can achieve this but they are not very comfortable. This roller is the best of both worlds. You get the stiffness of the PVC pipe and the softness of the foam which makes all of the difference when you’re trying to get deep. The ridges are stiff enough that you feel them but they’re not so stiff that they hurt. This roller is of a good quality that will last longer and work much better. This is an awesome Foam roller I tell ya! It’s very convenient because it fits easily in my gym bag, and it can easily fit in my locker too at the gym. It’s the perfect roller to roll out on after a tough workout. I really enjoyed the Free access to the foam roller video academy, it showed me some new ways to roll out I didn’t know how to before! I definitely recommend this fitness foam roller! Received this awesome foam roller in the mail a few days ago and first impressions are WOW! I already had a basic foam roller you see everywhere that I use a lot and when I came across this one I was very much intrigued. The build quality on this is FAR superior than regular foam rollers, I can see why they call it premium. Additionally, the functionality is SUPERIOR due the honeycomb pattern which applies a little more pressure on the muscles. Just a reminder, as a bonus for investing in the FM4L foam roller, you will receive lifetime access to our Foam Roller Academy, full of videos and articles all about foam rolling. 1. How often and for how long should I roll? There is no set amount of time, but daily for 5-10 minutes would be awesome. I know making the time for this might be tough, so I tell myself, and my clients, that anything is better than nothing. Two minutes of rolling out the legs is better than not doing it at all. 2. When should I use the FM4L roller? Unlike specific types of stretching, you can roll pretty much anytime you like. The two most common times to roll are right before you exercise (to increase blood flow and mobility) and right after exercise (to push out the toxins from the muscles and loosen up the knots). I also enjoy using it in the evening, while I am watching TV. 3. What makes the design of the FM4L foam roller so much better than others? Soft and smooth foam rollers were the 1.0 version that came out about 10 years ago. Since then, more firm and contoured designs have been released. Our honeycomb shape simulates a massage therapists knuckles digging into the muscles to get a much deeper experience. The hollow and short design of our foam roller make it easy to take on trips (stuff the inside with socks and underwear) and is constructed of materials that won’t break or deform. 4. What type of person should foam roll? I haven’t seen any studies to suggest that foam rolling is bad or dangerous for anyone, so I would say everyone can and should roll. But if I had to pick a couple types of groups of people that would most benefit, I would definitely say anyone over the age of 50. Muscles, and the fascia that surround the muscle, become more web-like as we age and don’t move or stretch as well. Rolling can keep the muscles much looser and younger feeling. Also, anyone who regularly exercises should roll, because you are challenging the muscles and that can create knots, tightness, and soreness. Those looking to improve their physical performances and decrease their running times also need to be rolling almost daily. The final group of people I believe could really benefit from rolling are sedentary people, or anyone who sits at a desk much of the day. The act of sitting puts undue stress in certain areas, and shortens some muscles. Rolling can significantly increase range of motion, tightness, and stress associated with sitting too long. 5. Is it normal for the foam roller to feel fairly painful when using it? Yes this is very common. The FM4L roller was designed to be able to grow with you as you improve in your rolling. In other words, the roller is a bit firmer than some others. The key to pain management with this roller is to modify the pressure used. Generally, you shouldn’t go past an 8 or maybe 9 out of 10 on your pain scale. If it is excruciating, then take a lot of pressure off. 6. How long do I need to use the FM4L foam roller before I notice results? You will notice results the first time you use it. Balance, flexibility, and muscle looseness should improve immediately afterwards. Longer term, the pain of rolling dramatically reduces as your body gets healthier and more massaged out. You should experience less muscle soreness after workouts and find yourself recovering quicker. 7. Does this foam roller really come with a lifetime warranty? Yes, if your foam roller breaks or deforms for any reason (except running it over with a car) we will replace it. 8. Why are you only selling them on Amazon? I believe that the FM4L foam roller should be in every house in American (and the rest of the world). Amazon is a great selling platform and reaches nearly the entire country. Plus the free shipping rocks! Boosting sales and 5 star reviews slowly over time will allow us to rank on the first page for foam rollers. Once a person decides to invest in our foam roller they will get exposed to everything else FM4L has to offer, which really becomes life changing. 9. Can I share this $15 off coupon code with anyone? Yes-please do share, but know the coupon code (FM4LLOVE) will expire at midnight, Friday, March 20th, so share soon! 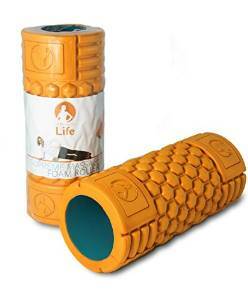 If you don’t have a foam roller yet, click here to buy one! Don’t forget to use the coupon code FM4LLOVE for a $15 discount! Yesterday, my trainer Joe shared with you some great tips for protecting your lower back and neck. Today, he is back for an encore as he gives you two simple cues to improve upper back posture and reduce shoulder injuries. I would estimate that at least 80% of my clients who are older than 45 suffer from moderate to severe upper back posture problems. Decades worth of sitting at a desk in front of a computer have caught up. To prevent becoming extremely hunched over later in life, Joe’s tips are crucial. Click here to order the Fit Moms for Life foam roller and enter coupon code FM4LLOVE for a great $15 discount on Amazon. The past few days you have been learning some awesome new ways to help your muscles recover, lengthen, and perform better. Up until now you have been focusing on the lower half of your body. In today’s foam roller lesson you are going to experience my favorite foam rolling exercises that are going to loosen up the mid to upper back and neck area. It almost feels like you have your very own massage therapist. If you are like me, you spend a lot of time sitting in front of a computer. This is very bad for your posture and for your back muscles. The exercises in today’s lesson will go a long way to reducing upper back and neck pain AND lowering your stress levels. Just one minute per day can make a huge difference. Have you ordered your foam roller yet? If not ->-> click here <-< to do so now and enter coupon code FM4LLOVE in the Amazon coupon box to receive a $15 discount. For the 150 of you who have already ordered and received your roller, it would mean a lot if you could leave a review on Amazon. This will give future purchasers the confidence in the quality of the product and the Foam Roller Academy. Have you struggled with lower back pain? Watch for a blog post in the next couple days. 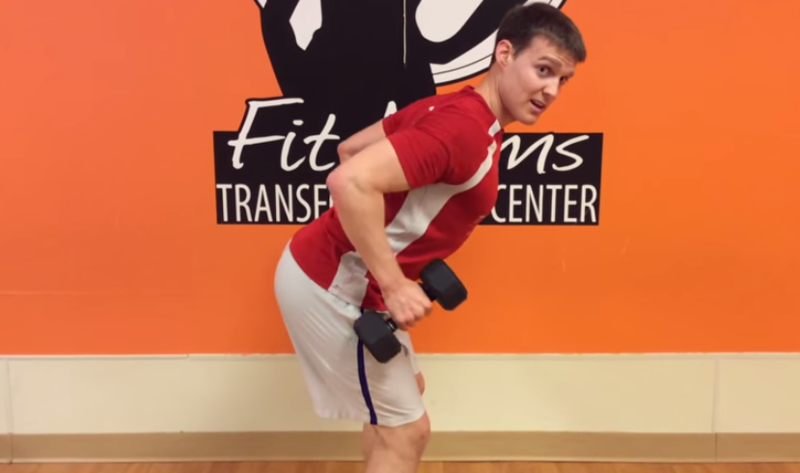 My trainer Ryan, who has a doctorate in physical therapy, is going to show you some powerful lower back tweaks you can use during your next workout to prevent lower back pain. The other day I announced the official launch of the Fit Moms for Life foam roller on Amazon. The sales so far have been incredible, so thank you for that. You should get your roller in about 2 days if you already ordered. A bonus to getting the foam roller is our Foam Roller Academy, a series of how-to videos on foam rolling. When starting to foam roll, I like to focus on two parts of the body that, when improved, can reduce knee and lower back pain dramatically. Whether we are walking, sitting, or wearing heels, our calves take a beating. A common problem is tight, or shortened, calf muscles. This is the first area of the body I want you to start to roll out. Tight, shortened, or overworked quads can cause knee pain along with many other problems. When rolling this area out, you are going to discover some trigger points, or muscle knots, ie lots of pain. Don’t have a foam roller yet? Click here to order the Fit Moms for Life foam roller and enter coupon code FM4LLOVE for a great $15 discount on Amazon. Look for a new blog post focusing on upper body rolling. These exercises will feel amazing, almost like having a personal masseuse. Do you struggle with lower back pain? Do you experience tightness in the hips, hamstrings, or calves? Does your upper back hurt from too many hours hunched over at a desk? If you answered yes to any of the above questions, you need to open up each email that I will be sending you. You only have one body and taking care of your muscles and bones (posture) is essential to living a healthy and fit life. Over the course of the next two weeks, you will learn how a simple exercise tool can radically change the way your body feels. In addition, a couple of my trainers with masters and doctorates in Physical Therapy will be talking about proper form while exercising. These small tweaks can have massive impact on the quality of your life short term and long. Today, I am going to kick things off with the official launch of the Fit Moms for Life foam roller. This has been nearly a year in the making and I am so excited to show you what it is and how it works. In the upcoming days I am going to be showing you specific exercises you can do to reduce or eliminate some joint and muscle pain, increase flexibility, and improve athletic performance. Are you Desperate, Embarrassed, Fed Up, Frustrated, Overwhelmed, or Feel Like You Want to Give Up Trying? Has anyone told you that you have changed?